While I enjoy the high profile jobs with important or even famous artwork I LOVE to work with small communities to save their public art. This art is often very important to the locals… maybe the only historical art in the community. Such was the case in the town of Lamesa Texas that has an old post office that is slated for demolition. 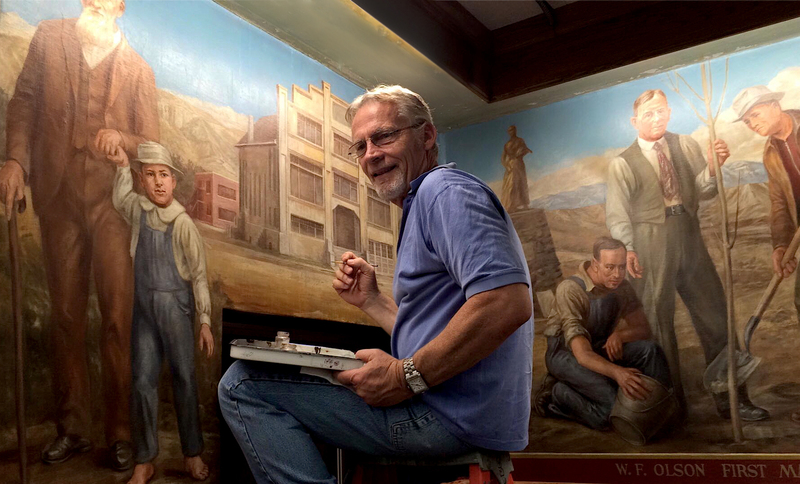 I’m often asked, over the phone or by email, “How much does it cost to remove a mural from a wall.” Well, we may be experts but giving an estimate a 1000 miles away from the project, sight unseen is beyond the magic that we like to perform. Perhaps they ask me for this quote because they think its a construction type bid that has a standardized catalog of hours and costs per square foot much like putting up wall board or running electrical wires. Not so. In fact, in the Socialist Republic of California, Art Conservation is considered a “Professional Services” field and is not issued a contractor’s license even though other contractors that do decorative painting and other tasks in historical properties are required. This sets up another discussion about art conservation services being bonded. Performance bonds are almost never required and I’ve never heard of a professional art conservator not finishing a project or stiffing a client on a contract (though I have heard of a non professional hack/quack that did). Since there is no licensing by the national professional organization, The American Institute of Conservation of Historic and Artistic Works (AIC), it requires a little research to nail down who is professional or not. Scrutinizing past work, talking to references and referrals is always good. And requiring that the person in charge of the art conservation services is a “Professional Associate of the AIC” are all good ways to confirm you are working with a professional and is something the Big Boys do (major General Contractors, government contracts etc). We look forward to discussing with you your project! Was this article helpful or interesting? Leave a comment and give it a THUMBS UP please so the search engines will find us more easily. Thanks! This entry was posted in Historic Buildings - Construction Sites, Murals, Travel and tagged mural conservation consultation project, mural restoration. Bookmark the permalink. You do really need to have an eye for art when you are talking about inpainting and things like cleaning up after smoke damage. You know what goes into the art and what it will take to get it looking 100% original! Thanks for writing about the cowboy art. We collect Western art and love it.